#3 seed BU continued its mastery of Merrimack, skating to a 3-0 win in the first game of the Hockey East quarter-finals. With goals from captain Wade Megan (photo), Matt Nieto and Ryan Santana and a second consecutive shutout by Sean Maguire. The victory puts BU one win away from an 11th trip to the TD Garden for the Hockey East semi-finals in the past 12 years. If the Terriers win today’s game 2, it will be Coach Jack Parker’s final game coached at Agganis Arena and on the rink named for him. Puck drop is at 7 p.m. with the game to be broadcast locally on WBIN. After a scoreless first period and a disallowed Danny O’Regan goal, Megan netted his 16th of the season, deflecting home a blistering slap shot off the stick of Ahti Oksanen. Patrick MacGregor also assisted. Terriers doubled the lead when Evan Rodrigues raced up the ice and his pass found Matt Nieto in the slot and the junior sniper bagged his 17th of the season with Oksanen picking up his second assist. BU began the third period on the power play and it clicked immediately as Ryan Santana banged home an O’Regan rebound with Nieto getting the second assist. Nieto, who earned first-star honors, now has 99 career points. Maguire stopped all 30 Merrimack shots and ran his Maguire ran his shutout string to 132:32. It was the fourth shutout of the year for the former Powell River Kings standout, who previously blanked St. Lawrence, Maine and Northeastern. A key to the win was BU staying out of the penalty box, picking up only two penalties in the game’s first 51 minutes. Then, as often happens when a BU-Merrimack games is all but decided, things got nasty with the teams combining for seven more penalties. "He’s still a fourth-liner for us, but he now kills every penalty and plays every power play, and nobody deserves it more than he does. He works so hard, and he’s a great example of, keep working. You never know what’s going to happen." ►Cason Hohmann didn’t make the score sheet but was superb on faceoffs, winning 14 of 19 draws. ►Terriers stifled all four Merrimack power plays and have now killed 19 in a row. 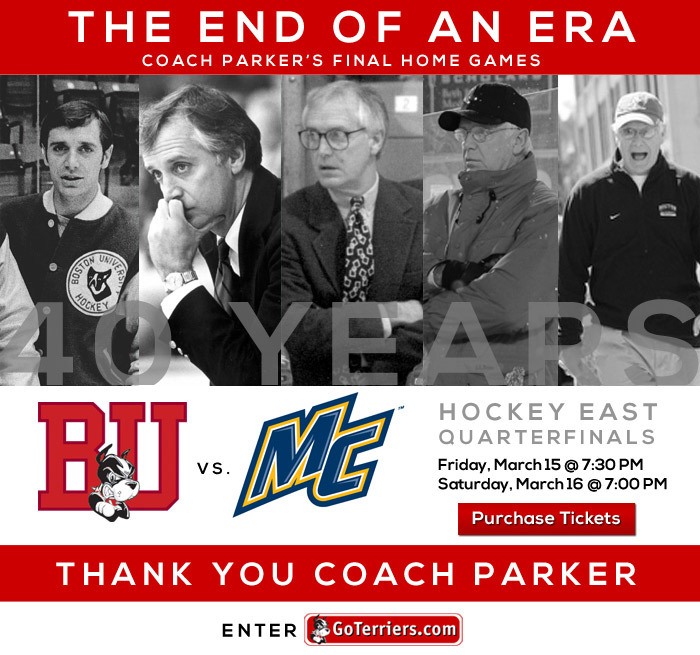 Longtime Terrier Hockey public address announcer Jim Prior will be honored with a Hockey East Founders Medal during next Friday’s semifinals at TD Garden. In addition to his 26 years of announcing at Walter Brown Arena first and then Agganis Arena, Prior has handled public address duties for the Beanpot, Hockey East and Massachusetts high school tournaments, and serves as Hockey East’s Coordinator of Minor Officials. 2014 recruit Jack Eichel’s unassisted goal late in the first period proved to be the difference as the USA U18s’ edged Muskegon, 2-1. Eichel has 3 goals and 6 points in his past five games. 2013 recruit Doyle Somerby had one shot and one penalty for the Lumberjacks. Former BU All-American Tom Poti was back on campus Friday, skating at Agganis Arena with the Washington Caps who will play the Bruins on Saturday. #3 Terriers host Clarkson at Walter Brown Arena in an NCAA quarterfinal game. Terriers bring a high-powered offense with seven players registering 25 or more points, led by junior captain Marie-Philip Poulin (49) and seniors Isabel Menard (43) and Jennelle Kohanchuk (41). Junior goalie Kerrin Sperry sports a 2.11 goals against average and a .921 save percentage and a 22-4-3 record. BU last played the Golden Knights in October 2010 at Walter Brown, edging the visitors 3-2.